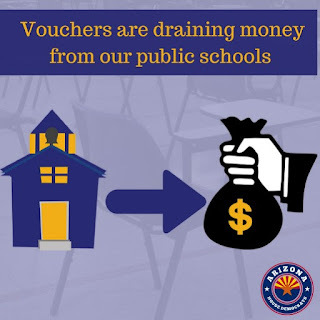 Phoenix Arizona-State Capital: Controversy continues to plague the Republican school voucher scheme, which shifts public dollars away from public schools and toward private schools. Following reports of little oversight of the voucher program and more than $100,000 of misspent public money, a new analysis confirms that vouchers aren't really helping the students they were purportedly designed to help. Republicans claim that vouchers provide resources for students from financially disadvantaged families to attend better schools. The truth is more than 75 percent of money is being drained from public school districts with "A" or "B" ratings, according to a new report. And many of the people using the vouchers live in rich neighborhoods. An Arizona columnist recently wrote: "Reality tells us that the program is helping suburban kids get out of high performing schools – giving them public money to help pay the tuition bill for private school. Poor kids aren't using the scholarships." Another columnist flat out called vouchers a "scam" and "Robin Hood in reverse, taking from the poor to give to the rich." Arizona has been recognized nationally as a model of what not to do with private school vouchers. Most Arizona students attend public schools, so expanding the voucher scheme has the potential to leave their schools even more strapped for cash. For House Democrats, supporting public education is nonnegotiable. We are standing with and for the majority of Arizonans who say our kids' schools deserve more. We agree that our kids, our teachers and our classrooms deserve to be prioritized before tax giveaways. We will keep fighting against legislation that would allow vouchers to balloon further, while we push for more resources for public schools.